Things to Consider When Building a Horse Fence | All Around Fence Co. Inc.
All Around Fence Company of Uniontown, PA, deals with all sorts of customers with different needs. Some people want fences for privacy, while others want them for livestock containment. Indeed, farmers often come to All Around Fence to ask about things like horse fences. Horses are rather large animals and the more you have the more fencing you will need. When buying/building a horse fence, there are several things to consider, including fence material, style, and height. 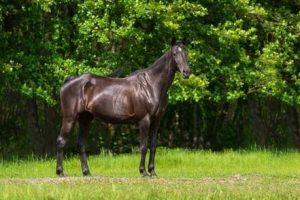 Most people who have a horse or two on their property typically go with wooden fencing, while those who plan to build a larger paddock to contain several horses go with electric fencing. Height-wise, horse fences are generally five feet tall or so. Wooden board fences are classic, beautiful, strong and safe. They’re also highly visible so horses definitely see them. A less pricey alternative that still looks wooden is the PVC board fence style. Made of plastic, this style looks like real wood. It is generally not as strong as actual wood though. Electric fences work well when a person has a lot of ground to cover and wants something economical yet safe and simple. Electric fences involve a charger and grounding rods. Besides electric and wooden horse fencing, there’s mesh wire. With its small square/diamond-shaped gaps, mesh wire is considered fairly safe, fairly maintenance-free, and, best of all, somewhere in between the cost of the other two major options. Mesh wire for horses needs to have openings that are not “too large,” though…if a horse can fit his hoof in the gap(s), they can become trapped, which is not a good situation as you’d imagine. Also, make sure it’s mesh wire rather than barbed wire because the barbs can injure horses. Finally, with fencing you’ll need other things besides the actual fence, such as posts (to support the fencing), fasteners/insulators (to attach the fencing to posts), and gates (to make for an opening in the fence where needed). When horses are introduced to their new fencing, it’s a smart idea to walk them around the perimeter to help them establish where their boundaries are located. For horse fencing information, call All Around Fence at 724-439-0331.